The famous “Don’t Honk” signs are being removed from the New York City streets, but a $350 fine still awaits those who dare to beep. 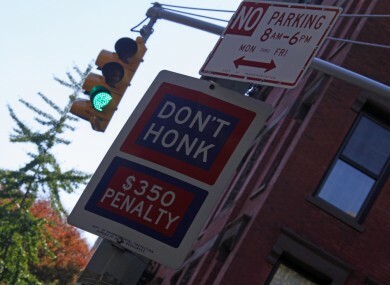 NEW YORK CITY’S “Don’t Honk” signs are coming down, but it’s still against the law to blow a car horn unnecessarily. The city’s Department of Transportation (DOT) says all the signs will be removed by the end of the year. According to The New York Times, city officials say the decision is part of an effort to de-clutter the streets of signs that generally go ignored. Unnecessary honking carries a $350 fine but is rarely enforced. The DOT says complaints about honking have declined 63 per cent since 2008. The signs were introduced during Mayor Ed Koch’s administration. Email “Don't Honk: The signs are going, but nothing has changed in The Big Apple”. Feedback on “Don't Honk: The signs are going, but nothing has changed in The Big Apple”.